The old "Blanda" of the Italiot Greeks, is the city which marks the beginning of the Costa Brava as one comes from Barcelona. As you approach Blanes northwards along the coast, you first pass the famous camping area "Els Pins" and then, before reaching the town centre, you come to the fishermen's suburb of S'Auguer - a corruption of S'Alguer - built on the rocky crest that must have been the centre of the old township. This crest continues out into the sea in the form of two rocks, La Palomereta and La Palomera. These, with the facing promontory of Santa Ana, enclose the extensive and magnificent bay of Blanes, protected to the east by a modern jetty. The promontories of S'Auguer and Santa Ana are the first of the rocky outcrops which plunge into the sea, giving a distinctive appearance to the varied and unique coastline stretching from Blanes up as far as, near France, Portbou. The villages dotted along the coast of the Costa Brava constitute an essential element of its enchantment. 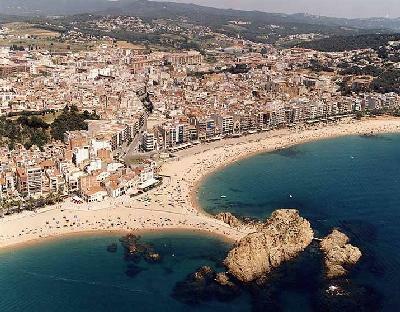 The first example of these is Blanes, a small city of 32,000 inhabitants with many hotels. It has a beautiful, long beach with very fine and golden sand. Its streets are well laid-out and clean; its houses are white-washed and spectacular. Noteworthy in the town are the fourteenth century modernized church of Santa Maria and the chapel of La Esperanza, the suburb of Massaneda and Santa Maria "l'Antiga", which dates from the ninth century; the ceramics museum donated by the doctor and writer Roig Raventos; the remains of the feudal castle on top of Mount Sant Joan, where you can admire a panoramic view of exceptional breadth and magnificence; and above all, the "Mar i Murtra" botanical gardens, created by the scientist Carlos Faust. In these gardens there are plants from the Mediterranean, from Central America and California, from South Africa. The irregular contours of the terrain have permitted the acclimatization of different species as well as furnishing various fascinating views over the sea and vast areas of the coast. Heading out from Blanes toward the nearest town by road, the route is set between the Serra Llarga and the fields of the interior, with intermittent sea views. Side roads lead from this route to the most impetuous coves of the next sector: those of La Forcanera and Sant Francesc. The latter's beach is particularly privileged, being sheltered from the north winds while still enjoying the gentle south-west breeze. At one end is S'Aguia - L'Agulla -, a pointed rock standing up above the coast where pine trees come right down to the water's edge, an attractive feature typical for the whole coastline. Further on you come to the beaches of La Cova de Treumal and Santa Cristina, two of the most attractive spots of the coast. They are characterized by unusual rocks and an abundance of vegetation which flourishes near the waters of the Mediterranean. High up the cliffs above Santa Cristina lies an eighteenth century hermitage and some hotels. The beach of Santa Cristina is very crowded in summer, and is the central attraction for two highly important pilgrimages every year: that of "Els Perdons" and the maritime procession "S'Amorra Amorra!" in which ancient relics are carried. It is a typical picturesque expression of the old traditions of the people in the region. Other excursions which can be made from Blanes into the interior go to the hermitages of Sant Francesc, Sant Joan, Santa Barbara, and Sant Pere del Bosc. 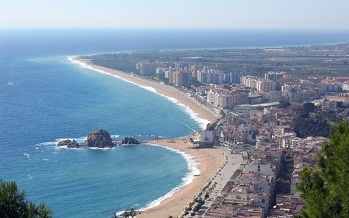 Regarding the original urban nucleus, there is no doubt that the township of Blanes was first centered on the promontory of S'Auger. The village, which various Latin and Greek writers called "Blanda" must have been situated right on top of this hill: they gave its geographical position as between Emporium and Barcino, very close to the Barnum Flumen, today the Tordera River. On the other hand, excavations have been made in the environment of Blanes, with the discovery of fragments of coins and pottery dating from the second century B. C., which indicate the possible existence here of an Iberian settlement. The presence of the Greeks was confirmed by the discovery of coins from Empiries, which were excavated and numerous amphorae fished up seven-eight miles of the coast. These indicate that Blanes was first and foremost a commercial port and a refuge for ships coming from the Roman Empire or from empires during the period of the Hellenic expansions. At this time, the pottery industry of Blanes was well developed and possessed its very own special characteristics.